Here are some of the quotes taken from comments following recent sessions delivered by PFC at The Danbury Unit at Halsey House in Cromer (a specialist dementia care unit in Cromer for older people), The Sheringham Stroke Support Club and The Friday Group (a community group set up to allow people with disabilities to meet up and take part in individual or group activities). “I haven’t seen the group this animated for months!” (The Sheringham Stroke Support Club). “Good song selection/concept behind song selection. Audience interaction with percussion instruments was good and use of props. Good to see resident engagement and smiles on their faces!” (Care worker, The Danbury Unit, Halsey House, Cromer). The session was useful because “I realised I am not breathing deeply enough!” (Participant, Breathe Easy – Sheringham Support Group for people living with lung/respiratory conditions). When asked why our participant had said the session was “Brilliant!” on our feedback form, they answered “It was just all so unexpectedly interactive and fantastic!” (The Friday Group, North Walsham). 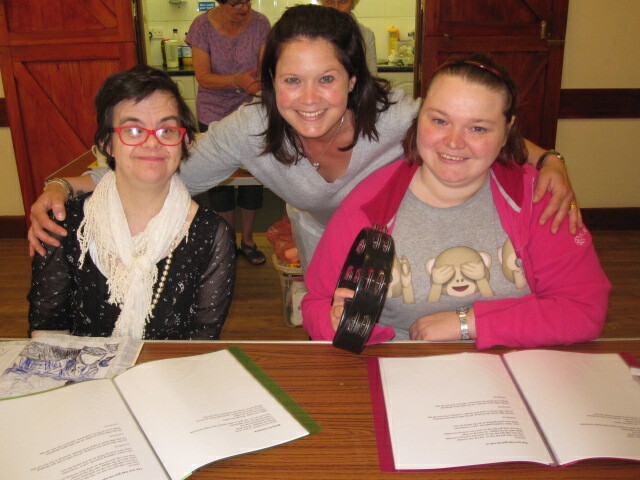 Participants and organiser of The Friday Group, North Walsham enjoying a Playing for Cake session and our songbooks! The most useful part of the session was that “we could all sing together” (Participant, The Friday Group, North Walsham). “Brings people together and gets them communicating more” (Participant, Breathe Easy – Sheringham support group for people living with lung/respiratory conditions). The session was good because “we could all join in with the musical instruments” and “it made me feel happy” (Participant, The Friday Group, North Walsham).